Why R/RStudio may take a long time to open? 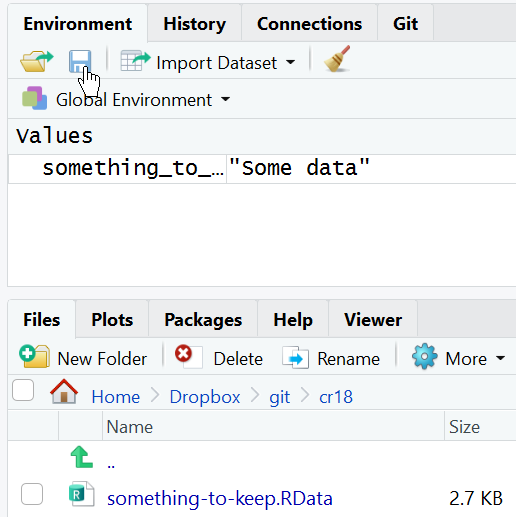 R/RStudio may take long to open (or even crash) if it is set to re-load objects from previous sessions. Unfortunately, this is the default. And it is bad. Each session should be self contained, and you should be able to reproduce your analysis entirely from your script. First I’ll show you how to change your settings to never re-load objects from previous R sessions. Then I’ll show you how to save time by writing and then reading objects that take a long time to produce. The next step will clean your environment. Before you do that you may want to save it. You can do that in RStudio from the Environment tab. Now restart your R session (Shift + Control/Command + F10). Your environment should now be empty. A great way to manage your workflow is to write a script that produces and saves an object, and another script that reads that object and uses it for analysis. You can now restart my R session (or close and reopen R/RStudio). Read the object you wrote before and continue your analysis.